This course is available in FAA, FTA, FMCSA and PHMSA modules. 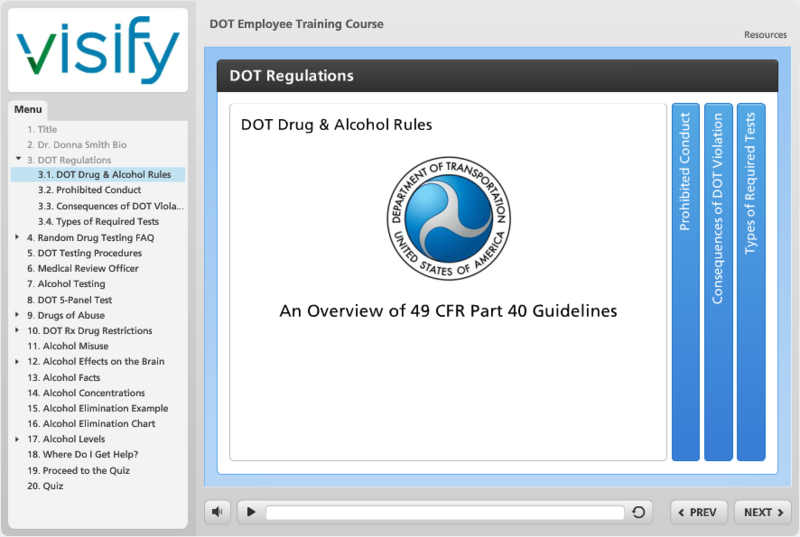 Understand DOT drug and alcohol testing rules and regulations. Learn how DOT drug and alcohol testing works. Find out in what circumstances testing is required. Understand what constitutes prohibited drug and alcohol-related conduct. All safety-sensitive employees should understand when federal regulations require drug and alcohol testing to be performed and how testing is administered at each step in the process. Reinforcing your DOT-compliant testing program through this training can help you clearly communicate expectations and address common concerns and misconceptions among your workforce about how DOT testing really works.